Referenced by GetProcessAffinityMask(), and QSI_DEF(). Definition at line 749 of file extypes.h. 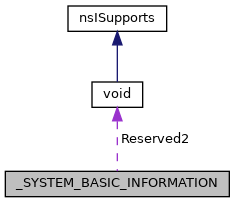 Referenced by BaseCreateStack(), DIB_CreateDIBSection(), QSI_DEF(), RtlpCreateUserStack(), and VirtualAllocEx(). Referenced by QSI_DEF(), and TestPhysicalMemorySection(). Referenced by GlobalMemoryStatusEx(), QSI_DEF(), RtlCreateHeap(), and START_TEST(). Definition at line 748 of file extypes.h. Referenced by GlobalMemoryStatusEx(), and QSI_DEF(). Definition at line 747 of file extypes.h. Referenced by GetPerformanceInfo(), GlobalMemoryStatusEx(), IntVideoPortFindAdapter(), PerfDataGetPhysicalMemoryTotalK(), QSI_DEF(), and SmpMakeSystemManagedPagingFileDescriptor(). Referenced by EngQuerySystemAttribute(), GetSystemTimes(), PerfDataRefresh(), QSI_DEF(), SmpCreateDynamicEnvironmentVariables(), test_GetSystemTimes(), test_query_basic(), test_query_interrupt(), test_query_process(), and test_query_procperf(). Referenced by BaseCreateStack(), CsrSrvCreateSharedSection(), GetPerformanceInfo(), GlobalMemoryStatusEx(), IntVideoPortFindAdapter(), IsBadReadPtr(), IsBadWritePtr(), PerfDataGetCommitChargeLimitK(), PerfDataGetCommitChargePeakK(), PerfDataGetCommitChargeTotalK(), PerfDataGetKernelMemoryNonPagedK(), PerfDataGetKernelMemoryPagedK(), PerfDataGetKernelMemoryTotalK(), PerfDataGetPhysicalMemoryAvailableK(), PerfDataGetPhysicalMemorySystemCacheK(), PerfDataGetPhysicalMemoryTotalK(), QSI_DEF(), RtlpCreateUserStack(), SmpMakeSystemManagedPagingFileDescriptor(), and test_GetPerformanceInfo(). Definition at line 486 of file winternl.h. Definition at line 487 of file winternl.h.